Time to choose your wedding entrance music! Your ceremony is over and it is time for the celebration to begin. After you have had your photographs taken and your guests have mingled and had a drink during cocktail hour, it is time to sit down for the reception. On your way over to the reception venue, give your MC or best man a call so that they can get all your guests to move to their seats. Alternatively, arrive quietly during the cocktail hour, mingle a little, have a drink and do the formal grand entrance once your guests have taken their seats. Or you could also enter while the guests are still having cocktail hour. It depends on how much of a grand entrance you plan to make. Your wedding entrance music or grand entrance song (as it is also known) is a tradition meant to announce you for first time as husband and wife. It is also tradition to announce the rest of the bridal party, but it is not always necessary with smaller weddings where everyone will know one another or with less formal events. The wedding entrance music you choose should reflect that the fun and celebration is about to start. You can of course choose something more epic if you wish, but generally it should be an upbeat, well known song to get your guests enthusiastically clapping and welcoming you. 1. 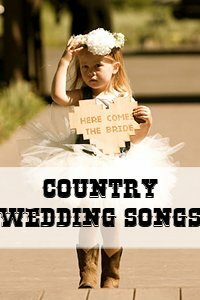 Will your guests and wedding party recognize the song, or is it too new or obscure to be appreciated? 2. Does it reflect your personalities as a couple and your wedding party? 3. Is this wedding entrance music appropriate for the wedding reception? - even with the most formal of occasions it is appropriate to have a fun and upbeat song for this occasion, but it is never appropriate, no matter how informal the reception is, to play an offensive song with explicit lyrics. 4. Do you want to use an instrumental song or version of a song, or one with lyrics too? 5. Is your wedding party to be announced too, or will it just be the bride and groom? 6. How would you like to be announced - as Mr & Mrs Jones, the Bride and Groom or simply John and Mary? 7. Keep in mind that you will only use a small portion of the song (the first minute or so), so choose something that has impact in the first 30 seconds. 8. Enhance your grand entrance further with some special effects - ask your dj or band if they can provide a bubble machine or a smoke machine, or hire one in from an audio visual company. Once your best man or MC has asked all your guests to be seated, he will gather up the two of you and your wedding party (if they are to be announced as well) outside of the reception area. He must make sure that the DJ or band leader is aware that you are about to do the grand entrance and should have the appropriate music ready. 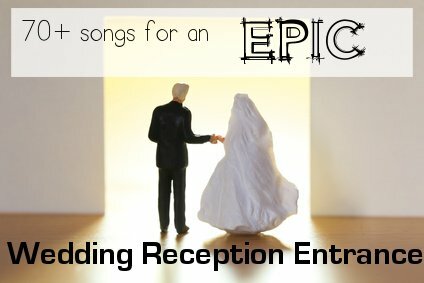 Choose an entrance song for your wedding party. The grandparents can be acknowledged and introduced where they are seated in the reception area. The bride's parents will then be introduced followed by the groom's parents, the bridesmaids and groomsmen, the flower girls and ring bearer, the maid/matron of honor and the best man. 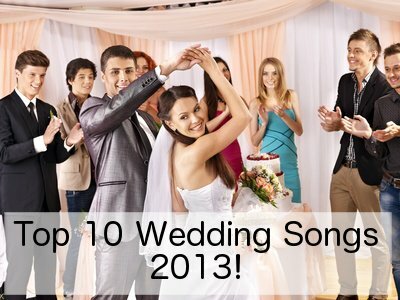 Choose a second wedding entrance song for yourselves, the bridal couple. Chosen your wedding entrance music? Now choose your background dinner music. Do you need some Wedding Reception Party Tips? You want your guests to have a great time don't you? You want them to dance and to remember your wedding night not only for the romance, but also for the incredible amount of fun they had. 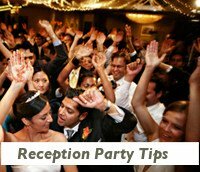 Click Here for a few helpful hints and tips to ensure your wedding reception party is the success you have always hoped it would be.